King Kong (2005) | Tales From The Ipe! 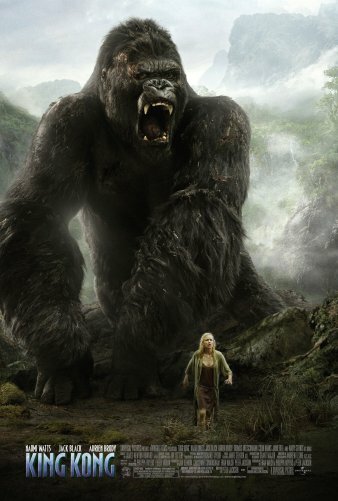 I finally watched Peter Jackson’s King Kong, the 2005 remake of the 1933 original. That was an interesting movie. I liked it, but it was a long 3-hour movie, clocking in at 188 minutes. Don’t get me wrong. I thought this was a good popcorn flick…… that should be watched over the course of 2-3 days. The story was a bit richer than the original 1933 version, and it added some additional realism missing from a movie from the 1930’s. I thought the special effects were superb, except for the Brontosaurus chase (yeah, that was CG special effects.) I thoroughly enjoyed watching Kong himself, because he came across less of a big monster, and more of a magnificent creature — old, scarred, toughened, lonely. A lot of personality in that big ape. I will say that the bug scenes were absolutely horrifying and disgusting. Talk about creepy crawlies. Yech. I read that Peter Jackson has an juvenile appreciation for that kind of stuff, but jeez, it was gross.